A few years ago, I saw an episode of 20/20 on ABC where they interviewed Costco founder, President, and CEO Jim Sinegal. Although he has since retired as President and CEO, I'm glad I shop at Costco and am more than happy to give the Seattle area retailer my business. He has made Costco into what it is today as the second largest retailer in the country by treating all Costco employees well to the point where it's like a family atmosphere working at Costco with a low turnover rate. 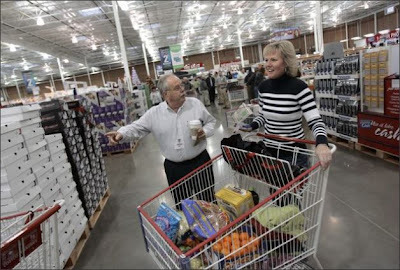 CEO Jim Sinegal talking to a Costco member while touring one of his warehouses. He puts employees' interests above everything else including shareholders. As a result of the great recession of 2008, we have seen numerous CEO's destroy their respective companies (ie Lehman Brothers) while still collecting a handsome severance package and golden parachute. It's quite refreshing to see a ceo who comes off as a humble, down-to-earth person with a modest salary and a big heart in Sinegal (and he even buys and wears dress shirts from Costco). He just seems like a good guy which you'll see by watching the video below.